In just over a week, Xiaomi will unveil the Pocophone F1, a phone that shares many of the flagship features of the Xiaomi Mi 8, while undercutting its price tag. And if you thought the unboxing video was a major leak, how about someone selling a pre-release unit? 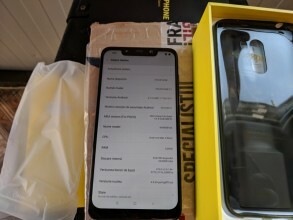 A Poco F1 was shortly available on Romanian site OLX, a local eBay competitor. It went for RON 1,999 – that’s €430, a nice discount on the €500 price of the Mi 8. 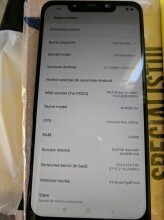 As you can see in the About screen, the specs are largely the same – a Snapdragon 845 with 6GB of RAM and 64GB storage runs MIUI 9.6 (based on Android 8.1). The phone reportedly scores 27,000 points on AnTuTu, which is in line with Mi 8 benchmarks. There will be other RAM/storage options too. Unlike the Mi 8 SE, the Xiaomi Pocophone F1 retains the infrared face scanning tech found on the pricier Mi 8. The screen is an LCD, though, a 5.99” IPS panel. And the dual camera on the rear looks less iPhone-y. The official unveiling of the Poco phone is on August 22 (Wednesday next week), though there are few secrets left. PS. the phone is no longer available, in case you were having ideas. This is one ugly phone! seriously manufacturers should stop putting a notch on every phone they make. 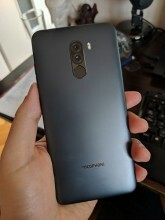 In this Pocophone, the chin below is so HUGE that there really isnt a reason to have a notch on top!